Jason Davis has been following the sunward dive of comet Lovejoy, and this morning he put together a spiffy animation of the comet entering the field of view of one of SOHO's Sun-monitoring cameras. SOHO has three coronagraphs, cameras built with an opaque disk that blocks light coming directly from the Sun. These allow SOHO to image the Sun's corona and coronal mass ejections, and also permit the cameras to see stars, planets, and comets near the Sun's position in SOHO's sky. 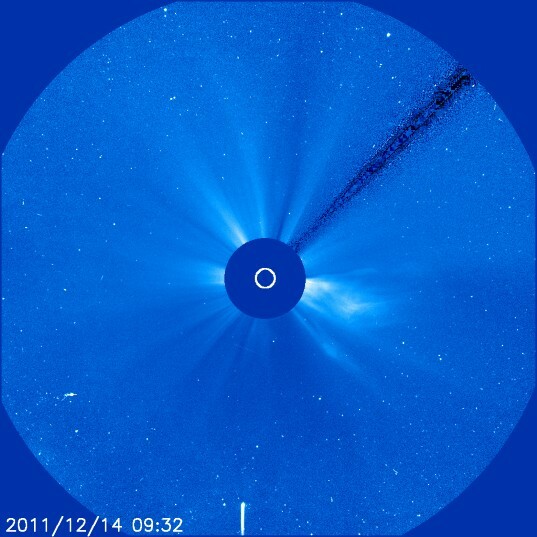 SOHO's coronagraphs are called LASCO (Large Aperture Solar Coronagraph) C1, C2, and C3. C3 has the widest field of view, 32 solar radii; C2, a medium 6 solar radii; and C1 a narrow 3 solar radii. It's in C2 and C3 that we can see comets, and Lovejoy has, as of this morning, entered the C3 field of view. Here's a still from that animation. This will be a fascinating event to watch as 2011 draws to a close! The comet is supposed to reach perihelion tomorrow. Jason was able to make that animation because SOHO is one of the missions that puts all its data online in near-real-time. With these data, armchair astronomers can discover new comets in the SOHO data. Visit the Sungrazing Comets website to learn more about how you can participate in that. Now, here's a public service announcement. The Sun is getting pretty active. It spits out coronal mass ejections a lot. There is a distinct chance that as Lovejoy approaches the Sun, there will be a coronal mass ejection. Our brains are wired to see causation when two strange (to us) events happen at nearly the same time. But a teeny tiny comet can't cause a coronal mass ejection. The comet is like a seagull, and the Sun an ocean. When a seagull flies over the shore and a wave washes in, did the seagull cause the wave? Nope. Waves happen all the time, and seagulls are too tiny to have any effect on the ocean. This is the same.